Snøhetta (the Snow Cap) is the highest mountain on Dovrefjell - a mountain region southwest of Trondheim and northwest of Lillehammer. 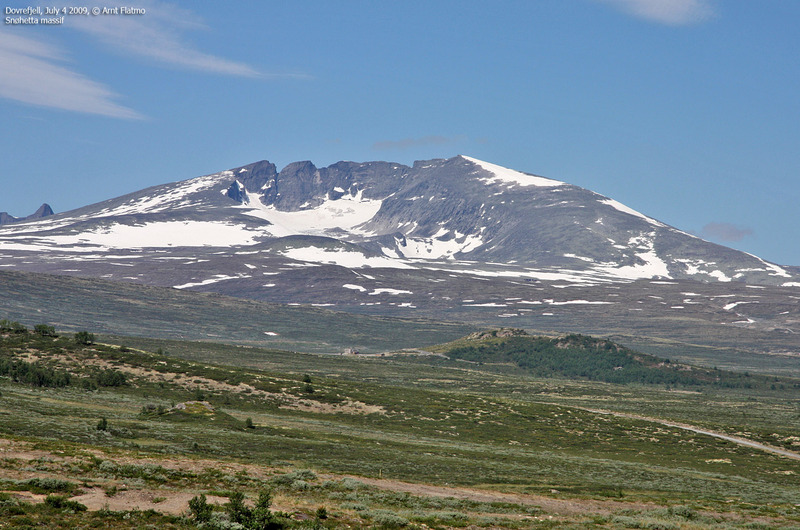 Dovrefjell is known for its beautiful nature, its wildlife (a.o. reindeer and musk), and the (former) weapon range and training area. 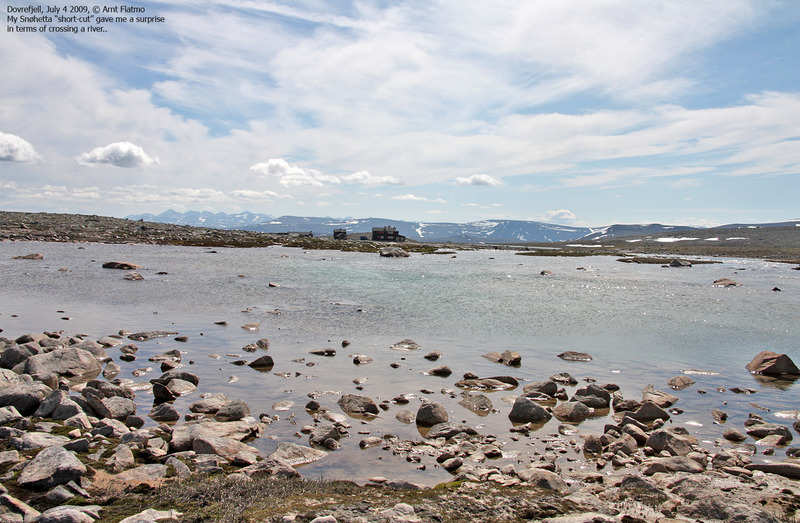 The Norwegian Army has now decommissioned its activities on Dovrefjell, and a long-term restoration program is in progress. 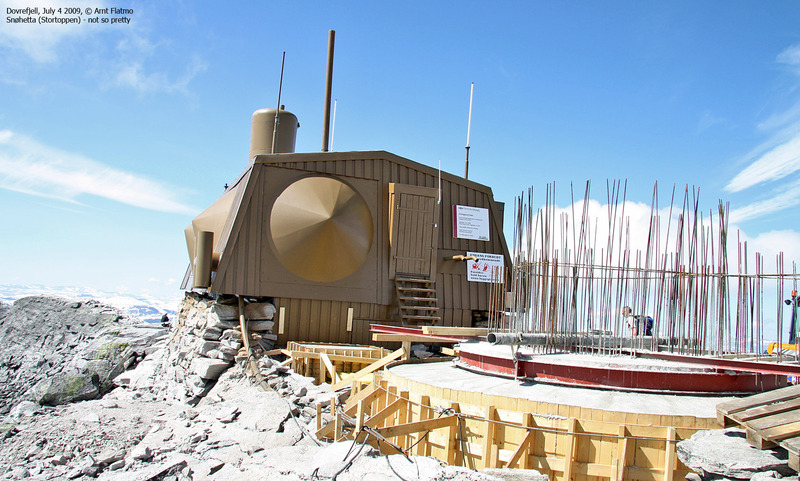 It will be interesting to see if this program includes removal of the building and platforms on the Stortoppen summit. 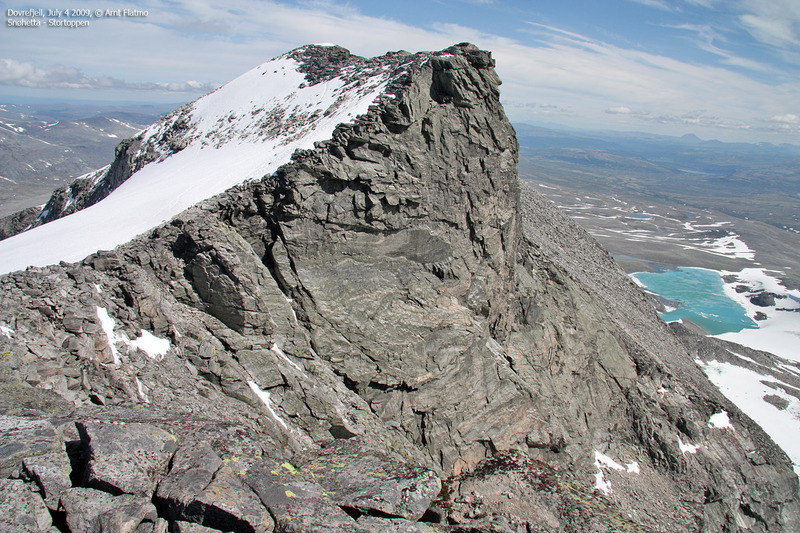 The Snøhetta massif has 4 distinct tops - Stortoppen, Midttoppen, Hettpiggen and Vesttoppen. All of these tops exceed 2000m, and Stortoppen is the highest Norwegian mainland mountain outside the Jotunheimen/Sognefjellet mountain range. Of these 4 tops - it is only Hettpiggen that isn't easily reached, and requires exposed scrambling or climbing in order to reach the top. 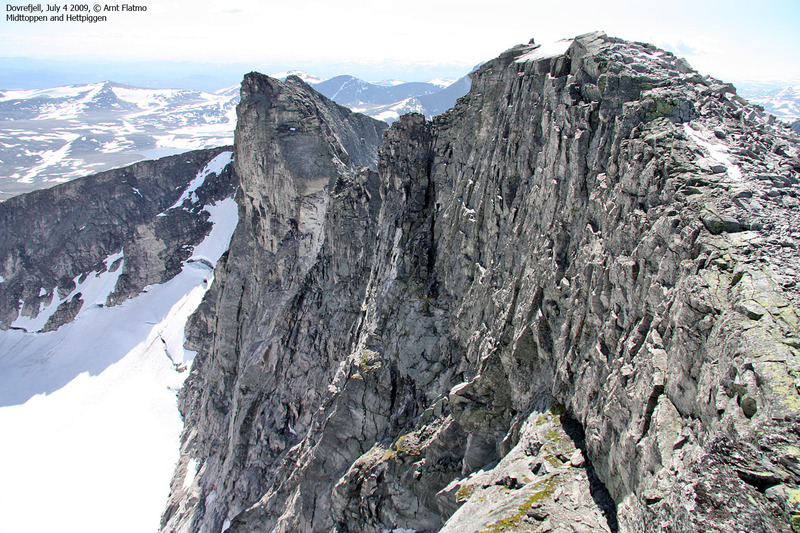 The Snøhetta traverse is a "classic" - in summer as well as in winter. This page will describe the route from Snøheim to Stortoppen, as well as the route to Midttoppen. On some maps, the name Midttoppen is placed on the peak this page refers to as Hettpiggen. 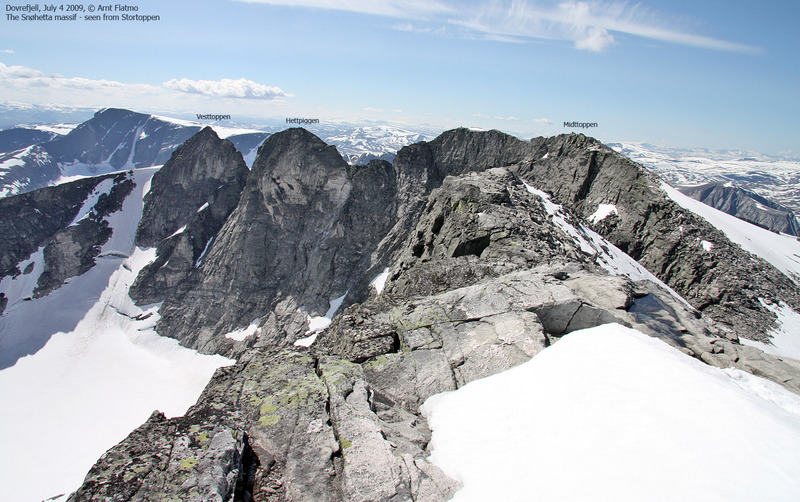 This site has used the book "Norges Fjelltopper Over 2000 Meter" as source for the mountain names. Close to Snøhetta, you will also find a handful of other tops exceeding "the magic" 2000m elevation. Larstinden, Svånåtinden and Skredahøin are the main ones - including a number of satellite tops that also exceed 2000m. The normal starting point for Snøhetta is Snøheim - a mountain cabin previously owned by the Norwegian Defence, but now owned by DNT - The Norwegian Mountain Tourist Association. 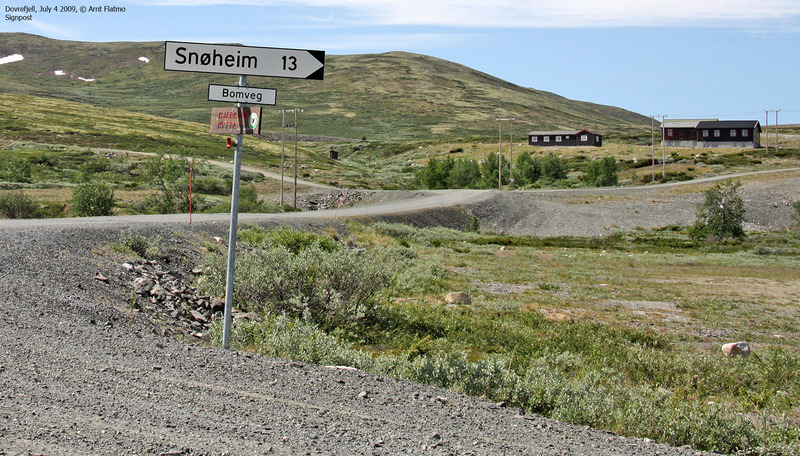 The Snøheim road (toll)is open July 1 - October 1, and regulated from Aug 20 and 4 weeks onwards due to reindeer hunting. There is an ongoing debate whether this road should stay open or be closed. For now, the road is open until 2012. Norwegian Defence Estates Agency: 61 24 25 00. Snøhetta is only a 7km walk from the Snøheim parking, while the route from Kongsvollen Fjellstue by E6 (via Reinheim) is more than 20km. At Hjerkinn the Norwegian Defence Estates Agency is conducting one of the most comprehensive environmental programs in Norwegian history. The entire weapon range- and training area is to be decommissioned and restored to it`s original condition within the year of 2020. The Snøheimroad is open for public access every year from the 1st of July to the 1st of October. The fee, 50,- NOK, is to be paid at the entrance. Stop- ping and parking are only allowed at marked areas. Do not disturb any animals in the area. The Reindeer are very easily disturbed, so do never try get close to them. The Musk might become aggressive and attack in self-defence, so you are responsible in case of an accident. Keep a distance of at least 200 meters (210 yards) from the animals at all times. Snøhetta (Norge 1:50,000: 2286m, Økonomisk Kartverk: -, UTM 32 V 513887 6909844) has a primary factor of 1675m towards the higher parent Glittertinden (2465m). The defining saddle (approx. 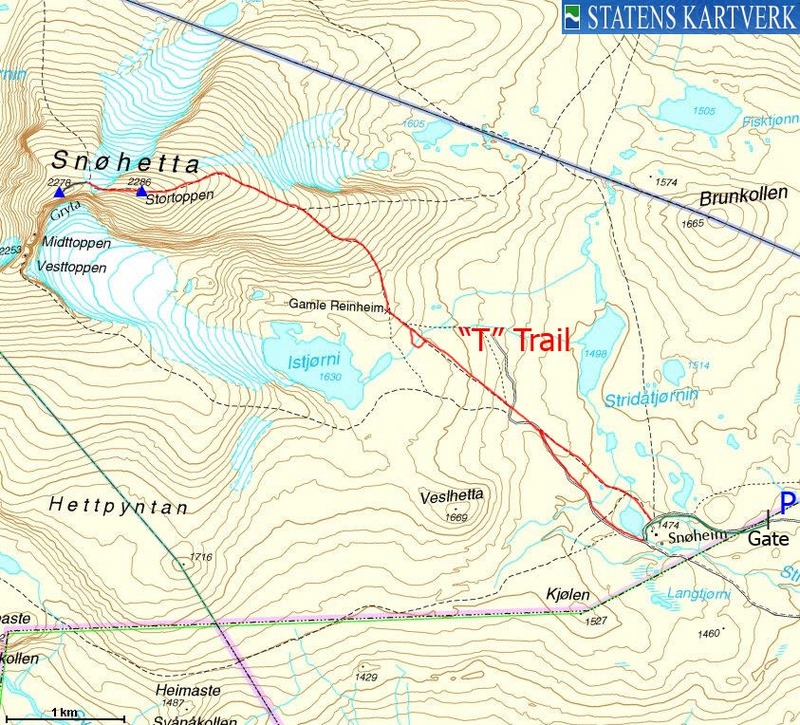 UTM 32 V 471716 6897669) is Lake Lesjaskogvatnet - 611m. This lake is the watershed between Gudbrandsdalen and Romsdalen valleys, and is the source for the rivers Rauma (Romsdalen) and Gudbrandsdalslågen (Gudbrandsdalen). Snøhetta has the 3rd highest primary factor among Norwegian mountains, only preceded by Galdhøpiggen and Jiehkkevarri. Midttoppen (Norge 1:50,000: 2278m, Økonomisk Kartverk: -, UTM 32 V 513211 6909826) has a primary factor of 48m towards the higher parent Stortoppen. The defining saddle (approx. UTM 32 V 513441 6909904) is found between these two tops. Ref. Norge 1:50,000 (20m contours), the saddle is within the range 2220-2240m, interpolated to 2230m. GPS measurement read 2285m (on the ground), averaged over a 5-minute period (error margin not recorded). 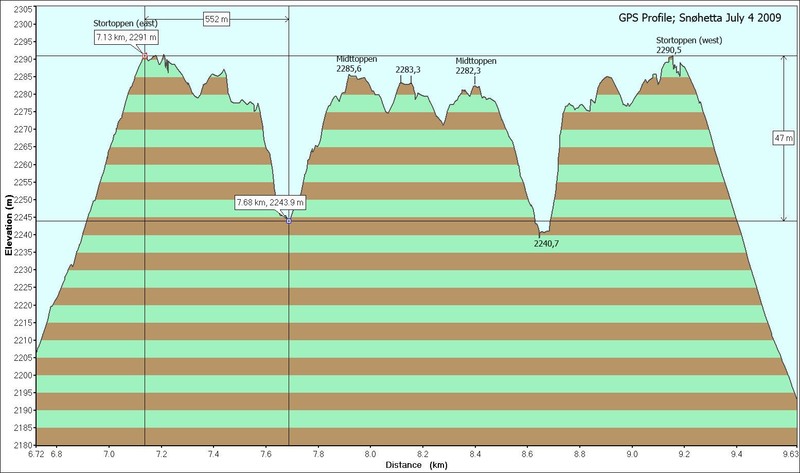 Based on the below profile, one can argue that the saddle should be closer to 2240m, which would give a primary factor of 38m. Some internet sites use 35m as primary factor for Midttoppen. The GPS is a useful tool, but does not always produce coherent figures.. 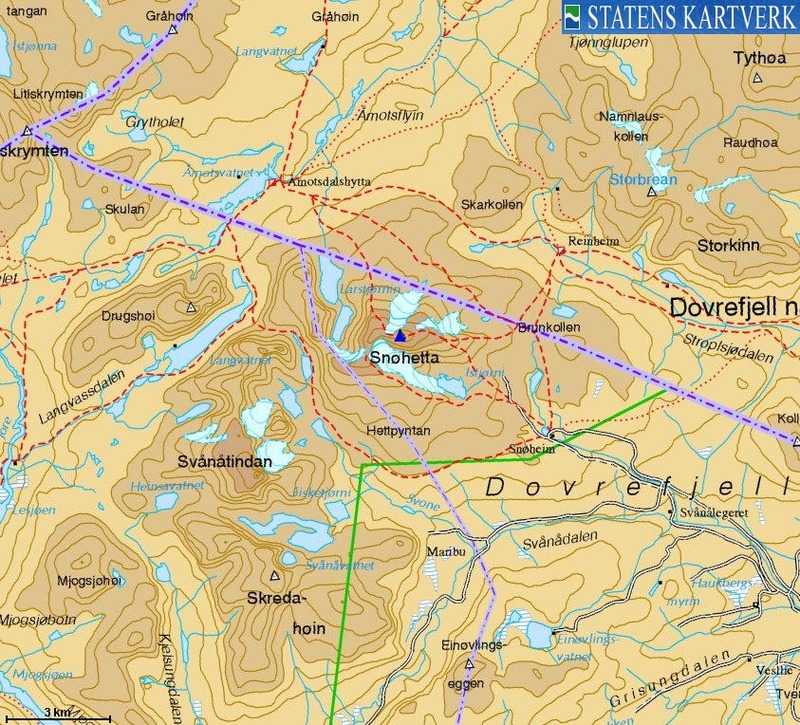 The nearest bigger villages are Oppdal (north of Dovrefjell) and Dombås (south of). The starting point for the Snøheim road is by the E6/RV29 (Folldal) junction at Hjerkinn. Close to this junction, get on the road west towards the train station, but after just 30m, turn right and follow a road up to the Snøheim signpost. You can also reach this road from two other unmarked junctions along E6. From this signpost, follow the Snøheim road 12,3km to the public parking (and pay toll early on - NOK 50,- per July 2009). This is a gravel road all the way, but OK for smaller cars. 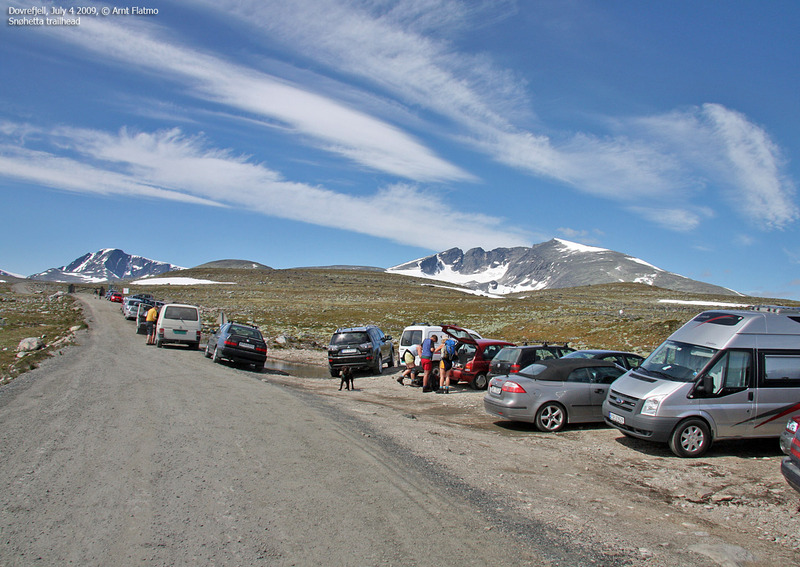 From the parking, follow the road to Snøheim (1,2km). At the first signpost, you can make a right turn and head towards Snøhetta on the east side of the lake. After rain and snowmelt, the river draining into this lake is wide, and you will have to look for a place to cross. 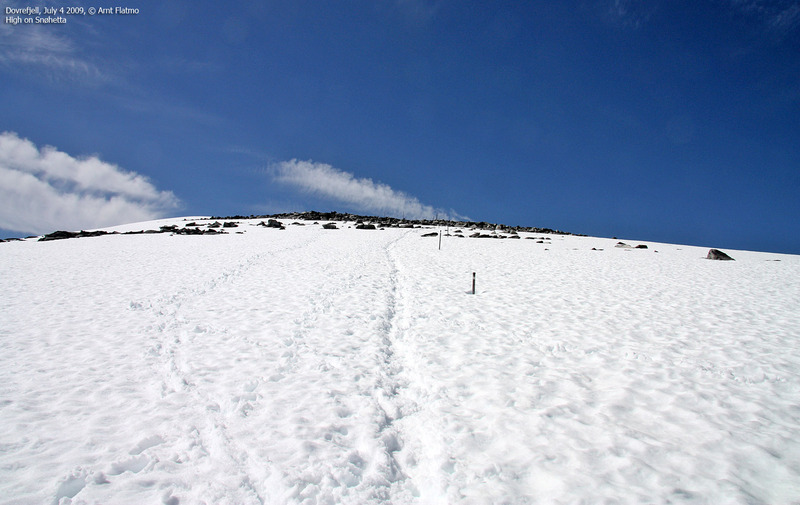 It is therefore easier to follow the marked path on the west side of the lake. Both these trails meet at approx. 1500m, and run towards the Gamle Reinheim cabin. You will have to cross the drain from Lake Istjørni, and if there is too much water in the river, seek towards the lake (go left) to find an easier place to cross. 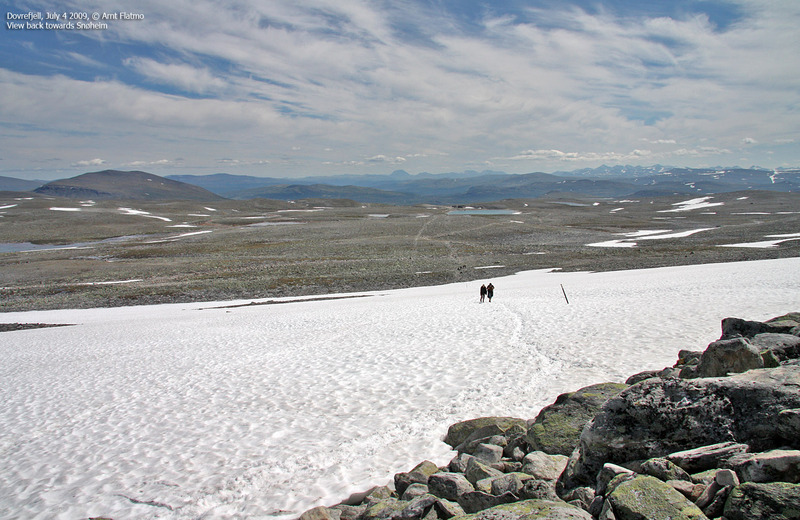 From Gamle Reinheim, follow the marked trail up the mountain and along Snøhetta's west ridge. The ridge is fairly easy to walk. Expect some snow fields near the top. 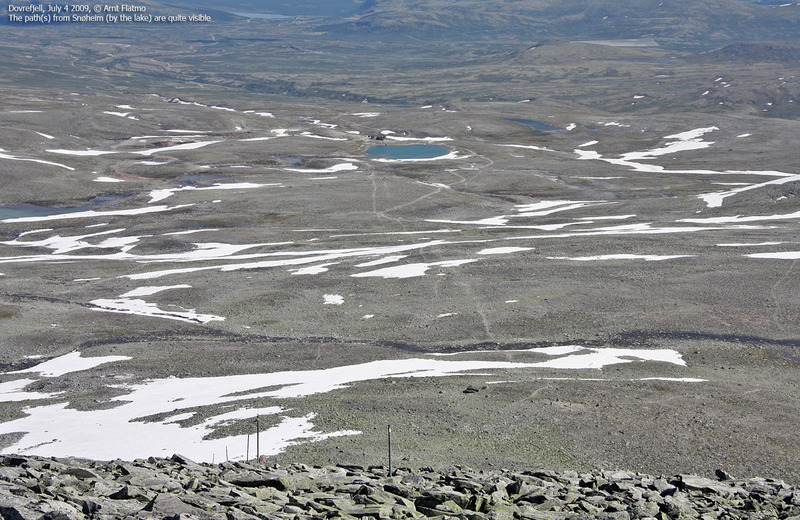 Snøhetta summit is "dominated" by a military building. You will find a proper cairn on the east side of this building. 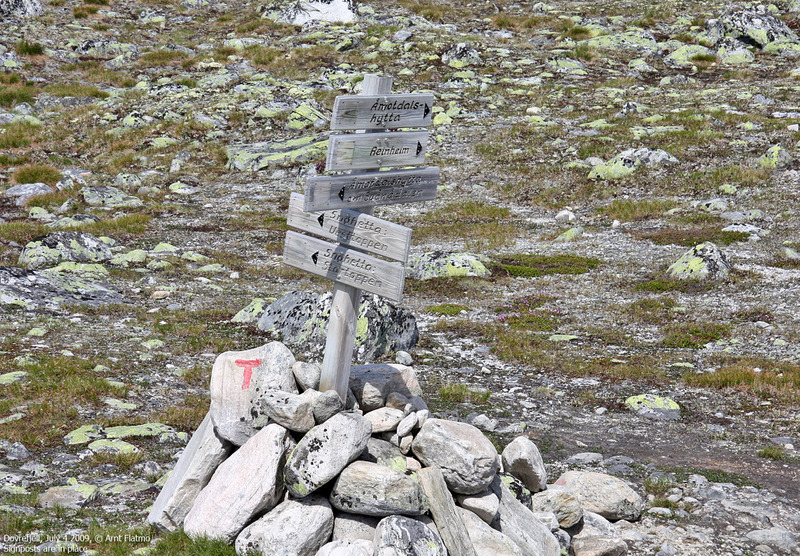 If you want to include Midttoppen on your hike, continue 400m along the ridge, then descend (along the "T" trail) into the col between Midttoppen and Stortoppen. Continue directly up to Midttoppen - or even 200m further, until you get to a viewpoint cairn, with a better view towards the other tops in this region.